A tall, white-haired pirate stands before you smoking a cigar. He wears fine clothes from many countries, all stolen from places he has raided in the past. 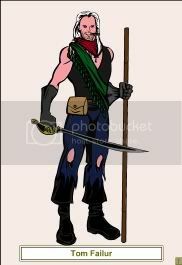 He carries a large cutlass and a staff. They carry 1 rabbit foot charm, 1 wild boar tusk necklace, 1 VickSick camera, 1 parrot feather charm, 1 pair of batwing earrings, 1 monkey claw charm, 1 skull, 1 pair of gold hoop earrings, 1 silver skull cross, 1 iron harpoon and 1 tiger tooth amulet. This character has been idle since 2014-09-10.